With the state of gaming today, I like to look back at old browser games that I used to play. Very early games like Alien X, SkyRacer: Impulse and Capoeira Fighter 3, and then say to myself: “Man, I can’t believe that a game like THIS could actually be playable in a web-browser.” With increases in technology, more of what I thought would be impossible back then are now more than possible today. One modern example of this includes a new Adobe Flash-based game called Rainbow Saga. 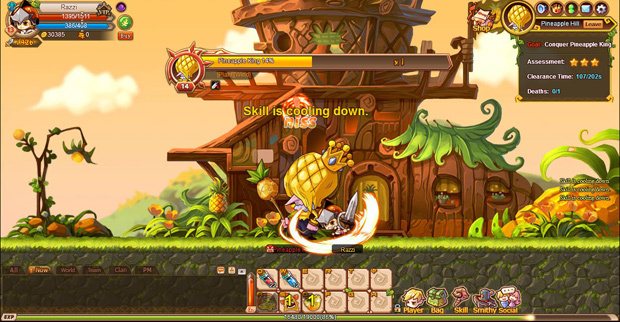 Published by Game321, Rainbow Saga is a fully-fledged, MapleStory-style MMORPG that’s playable straight in your web browser, which looks and sounds very impressive at first glance, but after a short play session for the game, it would seem to me that scaling an entire game that SEEMS like a retail quality title down into a web browser doesn’t come without a few sacrifices along the way. First off: The game starts out with no character customization options. Players will just pick their character as either a male or a female and that’s it. Then the game dumps players straight into a flashback story regarding some kind of ancient conflict before the player wakes up from a dream. Then the player is given the opportunity to pick out a name. The player also doesn’t get to choose which class they want to be as soon as they start out. They’re automatically stuck playing as a warrior-like novice character as they go through the tutorial. 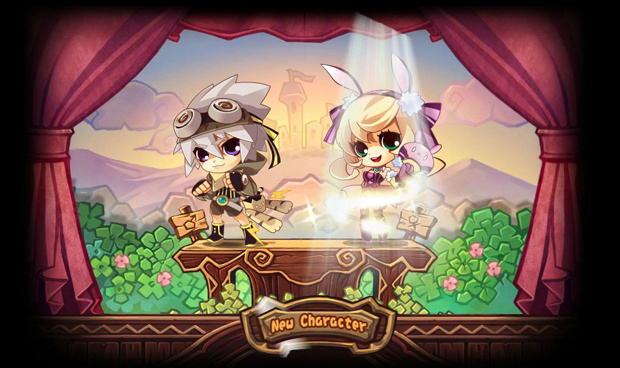 Luckily, it doesn’t take too long to get though, especially for those that have played MapleStory or any 2D platform game like it: Arrow keys for movement, spacebar to jump and A-H & Q-Y for skill and item usage. 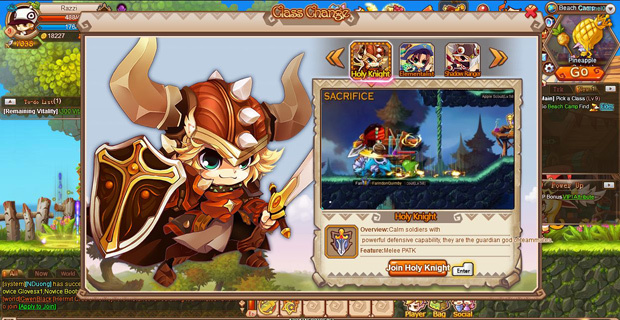 Only after defeating a boss and heading off to the main town are players given the chance to pick between one of three classes: Warrior, Assassin, and Elementalist, each of which fill out the tanking, DPS and support roles respectively depicted in the MMO holy trinity. However, for anyone that’s looking for some variety within these class types to set yourself apart from other players, you may be disappointed. Currently there aren’t any advanced or sub-classes available. After picking out my class, it was time for me to engage in some good ‘ol fashion quest and mob grinding. 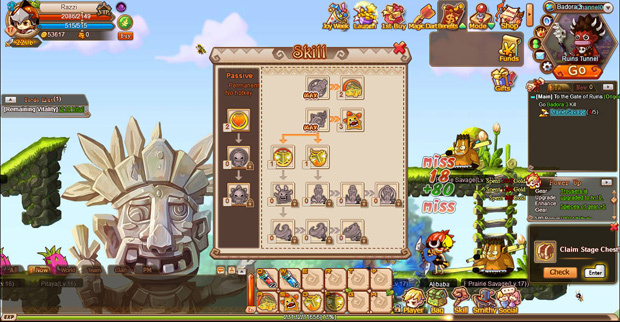 Rainbow Saga presents quests and mob grinding in such a mindless fashion that it constantly made me even wonder why I was fighting these mobs or collecting these quest items in the first place, as the game will allow players to auto –walk to their destination with a single mouse click, and enemies present themselves as trash mobs in every sense of the term, meaning that they will do next to nothing to stop the player from leveling. It also doesn’t help very much that the combat was incredibly repetitive, especially when compared to other 2D MMORPGs, as button mashing any skill that’s not on cooldown and chugging potions seems to be the name of the game, even in the later levels. And as another issue regarding variety: Rainbow Saga has one of the smallest skills trees I have ever seen in an MMORPG. 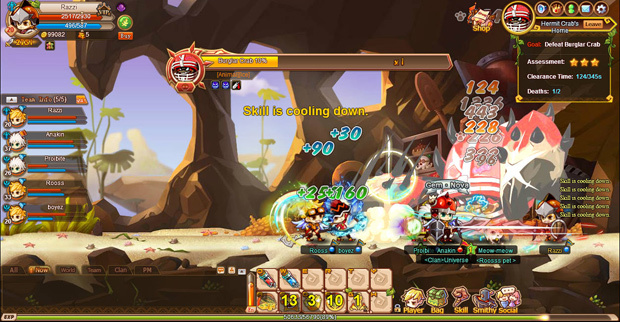 Players only have access between two paths for active skills and one path for passive skills. That’s it. As if the combat wasn’t already simplistic, the lack of skill variety will end up making combat in Rainbow Saga get repetitive really quickly. This kind of forceful monetization REALLY needs to be toned down by the time this game launches into open beta, otherwise it’s going to scare a lot of people way from the game, rather than keep them interested. Hell, it even makes me wonder why people are allowed to purchase in-game coupons while the game is in CLOSED BETA in the first place. 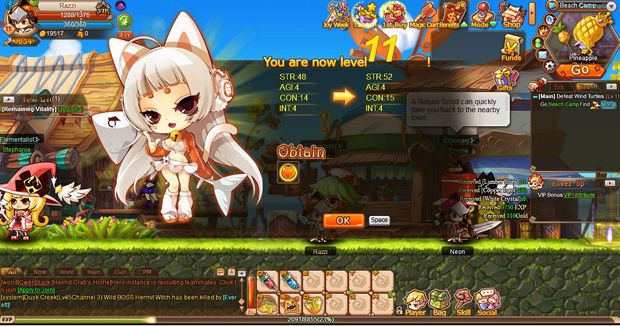 Of course, even without the forceful monetization, the core gameplay and the design for the world of Rainbow Saga doesn’t seem to be all that interesting compared to the scale of other MMORPGs that it’s imitating. With combat being extremely mindless and not requiring much thought other than mashing out skill attacks until the enemy is dead, along with not being able to manually dodge from attacks, it loses a lot of potential skill-based gameplay that could have really spruced things up as a browser game. The only time when I had to think and play carefully was during later boss battles when bosses would throw out all kinds of traps and obstacles that needed to be avoided. 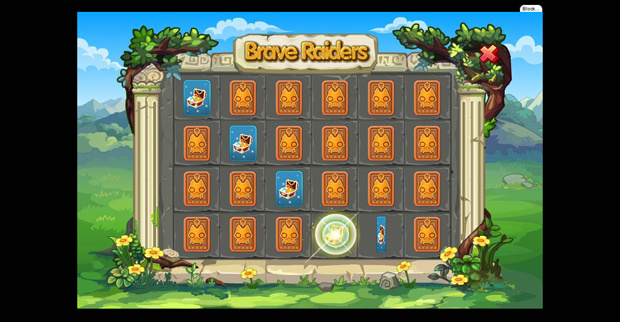 One thing that Rainbow Saga likes to do in order to break up the repetition is with a bunch of mini-games that you can play to earn gold and other rewards, such as a simple card memory game or a Bejeweled-style puzzle game. These diversions are okay, but they start to become a dull drag on the game since you’ll be playing them just as often. One reason why I felt Rainbow Saga was a step down from the other games that it was imitating was the lack of a grand open world to explore. At most, each zone will contain three levels of platforms to climb and traverse and nothing else, so there’s no real sense of exploration like in MMORPGs such as MapleStory, where there’s a huge world to explore, and while there is a straightforward path for players to take, there’s also many hidden areas to discover, and when I mean hidden, I really mean hidden as in “I feel like I’m not actually supposed to be here” kind of hidden. Rainbow Saga doesn’t have any of that, sadly. Just grab a quest, kill monsters on the map and head to the next instance. The only thing to help players along with this repetitive grind is the occasional bright/seductive smile from a half-naked catgirl every time they level up. Questing mostly revolves around killing a few monsters, upgrading your equipment or defeating a boss monster in some instant dungeon, which again, isn’t too exciting or interesting after a few minutes. There are also party instances where players can group up with up to four other players to take on upgraded versions of previous solo-instance bosses, but once again, these don’t really seem to rely on any real challenge or skill. Instead its all about upping your gear stats to the invisible pass/fail line, a fake difficulty curve that’s limiting players based on grind rather than twitch skill. 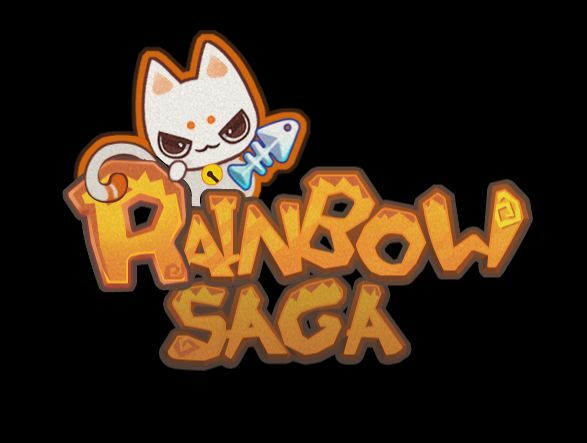 As it stands: Rainbow Saga doesn’t seem to present much to the MMORPG genre, even though a 2D Maplestory-style MMORPG that’s playable in your web browser is a rarity. Maybe somewhere down the line, the game will be improved with sub-classes, more challenging boss fights and maybe even better designed areas to explore. But as of now, it’s probably only worth a small passing glance for those that need a simple fix. We’ll see just how far this game evolves soon after it hits open beta.